Perched atop the single seat, the rider is faced with the same working environment as a petrol-powered bike. 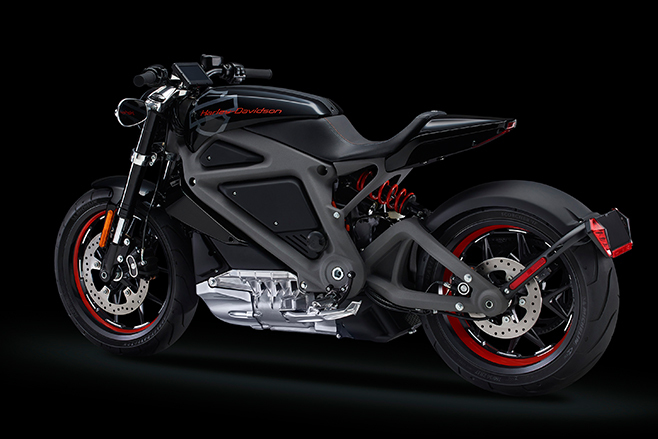 Given Harley-Davidson’s heritage, the last thing it’s going to do is invent a motorcycle controlled by a joystick. The straight handlebar is fitted with standard switchblocks, and the only thing which looks non-H-D is the single TDF LCD touch screen – which keeps the rider informed about all the important stuff (including speed, power settings and range). The revolutionary bike utilises an aluminium tubular frame and the suspension consists of a upside-down Showa Big Piston fork and a cantilever shock. Despite the bike being locked into Eco mode for my test ride in California, the sparky Harley’s three-phase 55kW (75hp) engine was still good for a 0-100km/h sprint in around 5.5 seconds. It should do it in around four seconds in Power mode. Torque is 70Nm and the range is 85km. 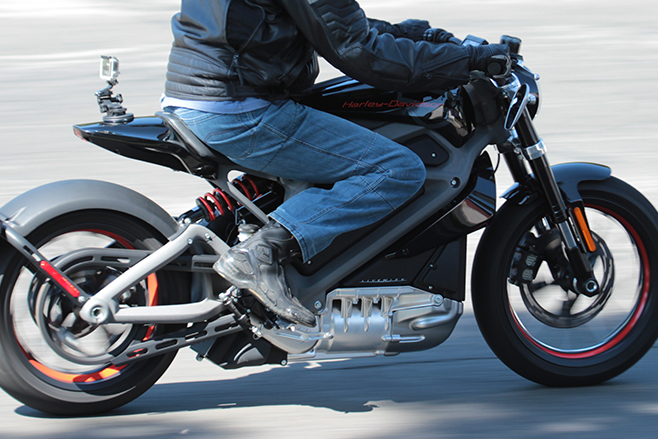 The LiveWire is unique in its use of a longitudinally-mounted three-phase AC induction electric motor, which drives the rear wheel via a single-speed bevel gear and belt. Harley claims the sound of the motor resembles a fighter jet. I’d say it’s a little whinier than that. Most surprising is the way the bike feels and handles like a conventional motorcycle. None of the components feel like a compromise between quality, lightness and appearance. The suspension is firm and comfortable, easily managing the LiveWire’s 200kg-plus weight, while soaking up the bumps. The single front disc brake and twin-piston caliper provide strong bite, with stopping assisted by the electric motor’s regenerative braking. Other than the odd feeling of pulling away from a standing start in silence, and the weird sensation of your left hand fingers instinctively reaching for the non-existent clutch, it takes very little time to get comfortable and confident on the LiveWire. Its drop-down handlebar, rearset footpegs and single racer-style seat allow you to cradle the machine like a nimble café racer. Flicking it into a corner and powering out the other side is super-easy and the bike’s a seriously fun thing to ride.